September isn't coming any quicker, but videos like this nourish me just enough to make it through the summer. These first two videos are short and entertaining. The first is from the stands at the Rose Bowl and the second shows how the students celebrated on the west mall of the UT campus. The last one is the entire hour-long National Championship Celebration held at DKR-Memorial Stadium on January 15, 2006. Suits and politicians mostly bored the crowd for the first half of the program until Mack Brown took the mic. He whipped up the packed stadium a bit, then asked five players to address the crowd. Vince Young, David Thomas, Michael Griffin, Rod Wright, and Justin Blalock spoke, joked and manhandled the crystal trophy. Griffin made fun of Matt Nordgren for some reason, then he apologized to Tarell Brown for the breaking his arm in the Rose Bowl. Blalock had fun with his announcement that he'd return for his senior season. 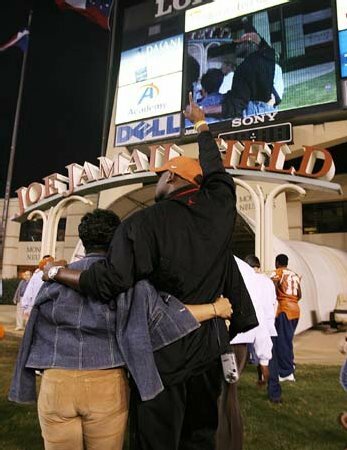 And Vince did one last victory lap at DKR. In the stands at The Rose Bowl - She's a Screamer!